Share your photos using the hashtag #AHLP19 on Twitter, Facebook and Instagram! The Arlington Holiday Lights Parade website automatically formats to your device, so follow along at the event for up-to-date info. The 2019 Arlington Holiday Lights Parade will brighten Downtown Saturday, December 14! Bring your friends and family to the Downtown/University District to enjoy the Annual Holiday Lights Parade. Thousands of people will gather for the pageantry which ends with the lighting of the Christmas tree. Note that all times are approximate and subject to change at any time. Please visit our web site on the day of the event and follow us on Social Media sites for the latest and most up-to-date information! The celebrations start at 2 p.m. in Founders Plaza with music, food and vendors! Bring your camera and take a picture with Santa before the parade at the Library at 100 S Center St.
At the conclusion of the parade, Mayor Jeff Williams has flip-the-switch honors, along with Santa Claus, to the Christmas Tree, a spectacular 50-foot blue spruce. All parade entries must complete an Entry application and description of entry form. Entry applications and description of entry forms must be received or postmarked by application deadline (see application). Because Santa will be on a special float in the parade, all entries are restricted from having a live Santa. All parade entries are limited to 13 feet in height. All floats, vehicles, persons walking and animals must have a display of lights. Entries must have a minimum of 100 lights total. Fire proof or fire-resistant materials should be used whenever possible. A fire extinguisher, Type ABC, must be on every float and in every car. Vehicles participating in the parade must be in good running order and be able to idle for periods of time without overheating. Vehicles are strongly urged to show up with a full tank of gas or have a gas tank in the vehicle for refueling. Absolutely no candy or any other enticements will be thrown or distributed from any entry. Anyone violating this rule will be removed from the parade immediately! Each float must be escorted down the entire parade route by two entry marshals (walkers) one on each side of the float. Any unit with children under the age of 12 must have two adults on the unit and one adult walking on each side. Vehicles not in the parade will not be allowed in the staging area due to limited space. Due to safety concerns, the parade committee suggests that children under 8 years of age not walk in the parade. They may ride on floats, vehicles or bikes under adult supervision. Following the parade, the pictures with Santa location will be announced at the tree lighting ceremony. We invite the public to bring their cameras. Signage for parade entries and/or parade vehicles is the responsibility of the parade entry. Vehicles need to turn off vehicle headlights while on parade route in order to showcase the Holiday lights on the parade entry. Float Building 101 – Need help getting started Click here for some float building tips. We have the right to refuse an inappropriate entry. Parade application fees are nonrefundable. 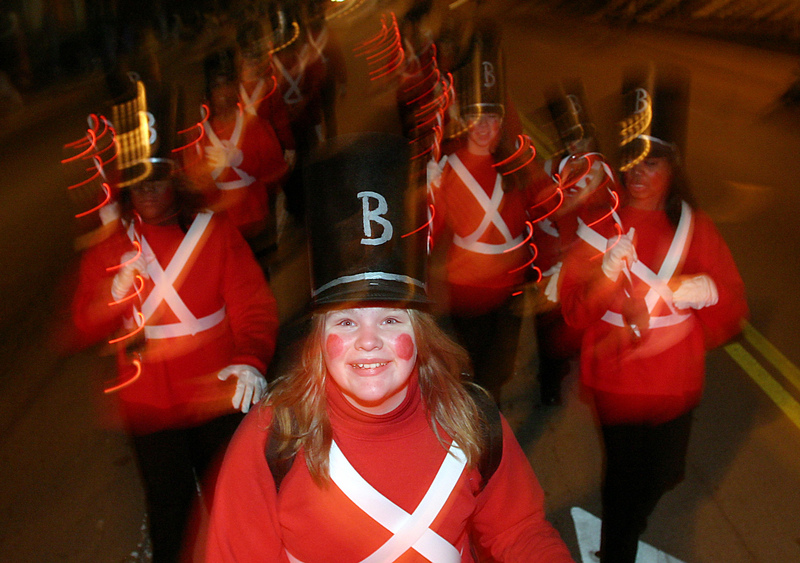 Are you or your organization interested in volunteering for the parade? What are you waiting for? Holiday Lights Parade 2019! ?